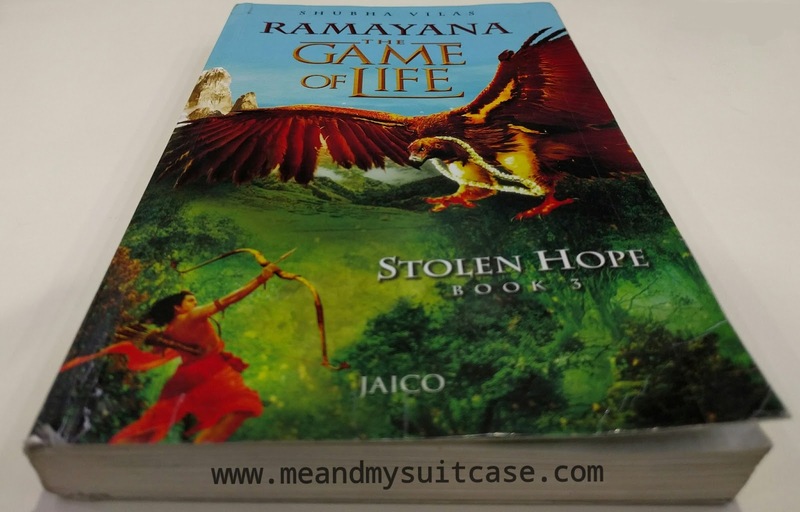 Third of the 6 book series "Ramayana: The Game of Life" is "Stolen Hope". A tale retold by Shubha Vilas following closely Valmiki's and Kamba's Ramayana for modern audiences. In the first book the author covered the period of Rama's life in sync with the twelve beautiful years in Ayodhya's life. In the second book he talked more on what defines the main characters like Rama's strong will, Sita's calmness, patience & resilience and Lakshmana's selfless services towards his elder brother and sister in law. In here, the third book continues with the trio's exile and their many expeditions and experiences. This book basically covers how they hop from one place to another in 13 years to finally get stabilized at one place suggested by Sage Agastya. Their many adventures, life in forest and specially how the trio survive in the maze of evil Dandakaranya forest is something to learn from where human values are put to test. Rama's righteousness, Lakshmana's loyalty and Sita's endurance reflect our own sense of values and judgment in the time of difficulties. The book is a contrast of extreme deception and extreme love, arrogant power and deep devotion. It also has given an insight into the relation between Rama - Lakshmana, Rama - Sita and Sita - Lakshamana. In this book some more important characters have been introduced like Sage Agastya, Marichi, Suparnakha, Ravan to name a few. All the characters are well justified in the book and their role well put. Characters act have been elaborated in a way that modern audience can connect with. The author has once again presented the very truth of life in a simple yet interesting way. Footnotes at almost each page and the anecdotes teaching you what to do and what not to, like in previous two books is again commendable. Loved the deer which is inscribed in the left corner of every alternate page. I loved third book more than the second one. The stories surrounding Sage Agastya, how the trio meet him and romance of Rama - Sita are very interesting. Once again with simple use of words, rich literature and beautiful cover illustration, author has won my heart. I recommend it to all mythology lovers. Non mythology lovers can read it too to understand the many aspects of life, the psychology in simple yet captivating words. Book- Ramayana: The Game of Life "Stolen Hope"
For the review of the first and second books of the series - click Book 1, Book 2.